Some time ago I received this watch. It had the crown broken off. Because this is a case without a screwback, it has a split winding stem. The movement comes out of the front. Because the crown broke off at the top, it was not possible to divide the stem where it has to be divided, so it was to long to get it out of the case. After a struggle and help from my collegue the movement came out. As expected it suffered from rust. The movement had a real bad amplitude, aprox 140 degrees, and was contaminated with rust, so a service was needed. And the search for a new crown/stem combination. Cartier parts are not easy to find. The Richemont group don’t deliver parts to the independent watchmaker. But thanks to fellow watchmakers I could obtain a new crown/stem combination and gaskets. They come not cheap though. After servicing the movement it had an amplitude of 300 degrees, of wich I am quite satisfied. and apart from 2 broken jewels there were no major problems. Here are the pics, more to come later. Service of a womans handwind watch. Eta ? Here some pics of a service I did on a womans watch. I placed a 1 eurocent coin next to it to compare it. It has been a while but here is another before.after. It is a beuatiful white dialed 1974 Citizen with original bracelet. I Polished the case, changed the crystal and serviced the movement. This is what you get when you have some time left. Made it from parts I had lying around in the partsbin. I found in an auction this beaten up Russian watch. I am rather fond of the movements so I thought I make a bid and take my chances. 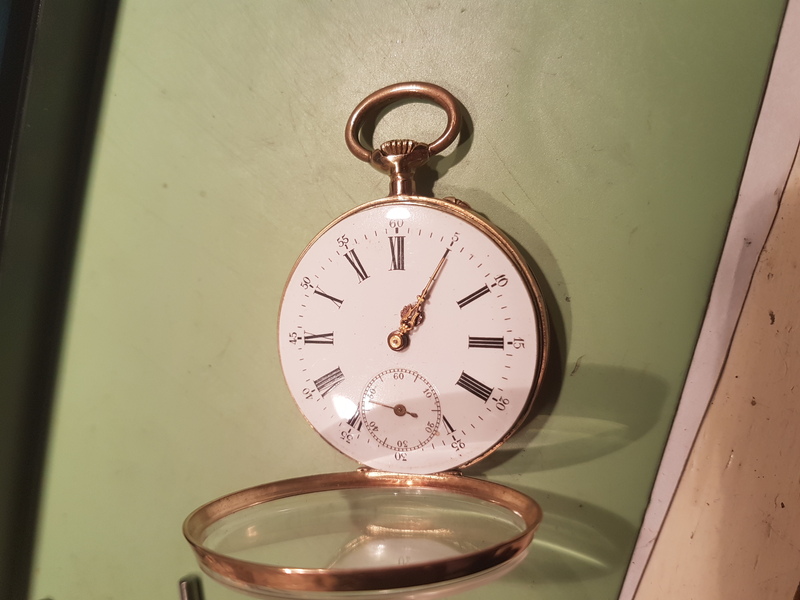 After I opened it up and dismantled the watch, I found a fine russian Poljot movement. The dial has suffered over the years, but still has its charmes. It turns from eggplant purple to brown, depending on the reflecting of the light. After polishing the case, changing the crystal and buffing the hands it turned out quite nice. The movement has had an overhaul and is ticking like in its glory days. I really like the Doxa Sea Rambler. It is a collectors item and not much for sale. I transformed a Seiko into a Soxa. As always, the movement had a complete overhaul. As you may know, (or may not know) we have since April 2013 a King. And he is visiting our little village in April to celebrate his birthday. Today I started servicing an epic 6105-8100. The owner wanted a new crystal,dial, bezelinsert and hands. I could convince him to keep it original, and only change the old crystal for a new sapphire. In November I got this watch. There was a challenge !